It was around lunchtime on a Saturday and I felt Penn Station’s summer mugginess cling to my skin. The second I left the train, my legs began to adapt to the brisk pace of New York City, forgetting the slightly more relaxed Long Island walk ingrained into my limbs. The escalator hummed under my feet as my elbow touched the safety rail, and around me were hurried commuters looking down at their phones or towards an endless distance, fervently hoping to avoid making eye contact with any passersby. The congested yet comforting city air hit my face as I hit ground near Swarovski and Starbucks. My brain enteredinto task mode; I need to go towards the Theatre District. I need to make my dinner reservation. I need to be on time for the play. 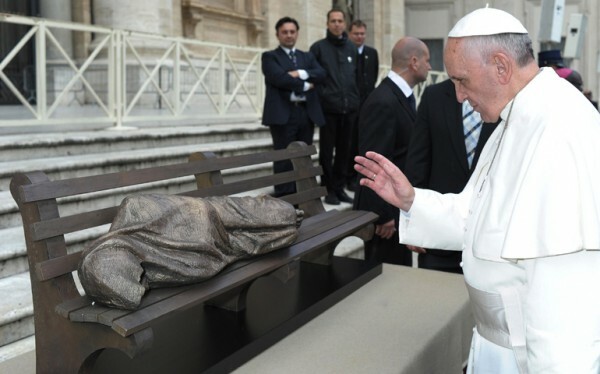 However, my thoughts stood still as my eyes fell upon a hooded figure alone on the sidewalk; a homeless man in a wheelchair, glancing at the floor as people, seemingly unaware of his presence, hurriedly walked past him. My heart dropped, and suddenly nothing else mattered. The floodgates opened and I felt a rush of emotion. This was just a few days after I had returned from Lourdes, and so the experience was still fresh in my mind and heart. Sometime before, the other volunteers and I boarded our Air France flight, unpacked in our hotel rooms, and explored the little town nestled near the Pyrenees. 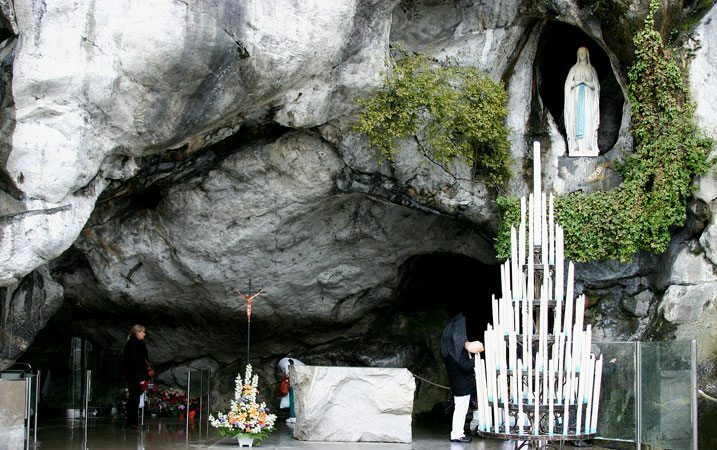 The beauty of Lourdes was the kind that reached out and pulled your soul into it so deeply that you knew every sight you took in would never leave you. But, the true beauty was not in the quaint cobblestone streets, meticulously groomed plant life, or the humming Gave de Pau River; it was in the volunteer work and stewardship. The funny thing about Lourdes is the overwhelming realization pilgrims tend to experience. The Blessed Mother has a way of turning our conceptions on their head and showing us that the reverse of what we think is what is holy and just. There, the sick, elderly, disabled, and marginalized stand at the center stage, and rightfully so. The able-bodied care for them, showing them the love of Christ through His mother, Mary. The spring water flowing through what the French call the “piscine’s,” or baths in English, is that which Mary revealed to St. Bernadette and is the source of 67 miraculous healings investigated and confirmed by the Catholic Church. Our communal praying of the rosary in English, Spanish, French and German calmed whatever anxieties I encountered and prepared me to face my first shift in the baths. There is too much to say about this humbling experience; encountering the elderly, vulnerable, weak, broken and pained of this earth was like looking into a mirror and seeing a part of yourself you had never seen before, only to find that even the most damaged areas are wholly loved and cherished. I bathed children, carefully removed socks from elderly women, prayed in different languages with pilgrims, and held women who reached out their arms to me after feeling the chill of the spring water. I, too, dipped in the waters and experienced the love of the Blessed Virgin Mary; without soap or a sponge, the pure, unadulterated water cleansed me as I had never been cleansed before. When I saw the man outside of Penn Station, I wanted to push his wheelchair to the Grotto, pray with him, and remind him of his worth as God’s creation. But even though I felt so close to Lourdes, in reality it was miles and miles away. Words are futile when trying to express the magnitude of this mission trip, but if there is one fact I can try to express, it is about humanity. Each and every individual, whether it is a friend, family member, adversary, or stranger, is so lovingly created in God’s image and saved by the grace and sacrifice of our Messiah, Jesus Christ. In this series of writings, I hope to support the principle we know as a church body yet not always as society of the unchanging and absolute importance of each child of God. Even as we journey through a Post-modern age of political turmoil, community conflict, and internal struggle, one truth remains static — each human person is dignified, holy and special in the eyes of the Creator. As Catholics, we recognize the power of prayer. Let us turn to Our Lady of Lourdes for strength and compassion in our journey to recognize the dignity of the human person. Hail Mary, poor and humble Woman, Blessed by the Most High! Virgin of hope, dawn of a new era. We join in your song of praise, to celebrate the Lord’s mercy, to proclaim the coming of the Kingdom and the full liberation of humanity.